Several options for placing calls are presented. These functions can be used with the Communication Buttons, by right-clicking on a Contact, or you can input a number to Dial for Voice or Video Calls by clicking the Dialpad Button. To place a call using your Dialpad, select Dialpad icon. Enter the phone number using the application’s keypad or your computer’s keypad. Click on the Call button icon or enter on your keyboard. Your call will then be placed. To place a voice call from your Contacts, select the Contact icon. Select the Contact, right-click and select the Call option. Select the work number or extension, if the contact has multiple numbers associated with their information. Select a Contact by clicking on the Contact Icon. Right click and select Call from Phone. Select the work number or extension, if the contact has multiple numbers associated with their information. An incoming call will ring your desk phone. Once your desk phone is picked up, the outbound call will be initiated. Right click and select Video Call. Select the work number or extension, if the contact has multiple numbers associated with their information. Once a number is selected, a video call is initiated. From the chat window, click Call, Video Call or Call from Phone. A call will be initiated to that contact. Select from Call or Call from Phone icons. A call will be initiated to your Conference Bridge and your Conference ID and Moderator PIN will automatically be entered. 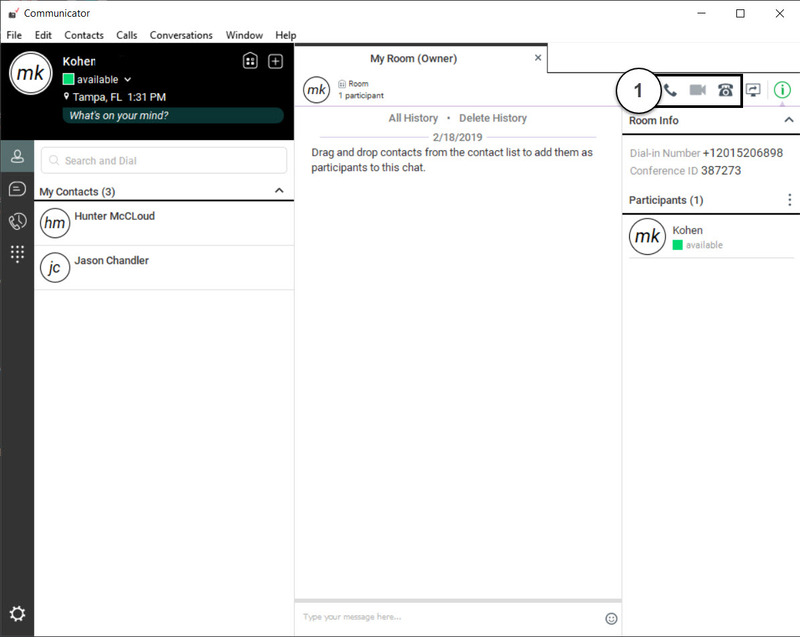 Others in your My Room session will be able to join your conference bridge by pressing either the Call or Call from Phone icons. Another way to initiate a Voice Call, Video call or Call from Phone is to hover over a contact. From the Contacts tab, hover over the contact you wish to call. Select the type of call you would like to make: Voice call, Video call or Call from phone. To end the call, press the Hang up icon, which replaces the Call icon when you are on a call. When you receive an incoming call, a pop-up notification is displayed in the lower right corner of your screen. Click the green Audio button to answer call. For Audio only, click the Audio button. To decline call, select the Decline button.